Ticket includes two nights camping on this property at Hotel Luna Mystica in Taos, New Mexico. 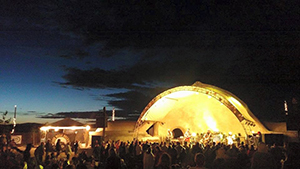 Located right next to the Taos Mesa Brewing Mothership and tucked near the Sangre de Cristo Mountains, you’ll experience a weekend with like-minded people outdoors sharing music, food, stories and touring tiny homes. A portion of your ticket will be donated to Rivers & Birds Inc. a nonprofit organization which provides experiential education adventures that celebrate the interconnection of all life and inspire individuals as leaders for Earth stewardship and peace. THIS IS A FAMILY-FRIENDLY, PET-FRIENDLY EVENT (ALL ARE WELCOME). Vans, buses, trucks, cars, motorbikes, swags, RVs are welcome – bring what ya got! The only requirement is that you have an open mind, enjoy alternative ways of living, and want to meet some interesting people. Bathrooms and showers on site. Location DOES NOT have electric on site. Off-grid electric setups are welcome, but NO GENERATORS PLEASE. You are welcome to fill up your water bottles or grab food at the brewery if you’d like. Please bring enough water and food for the weekend. Pack it in, pack it out. We can’t wait to see you out there!